S/M (M/L) = 47cm/18.5" (52cm/20.5"). 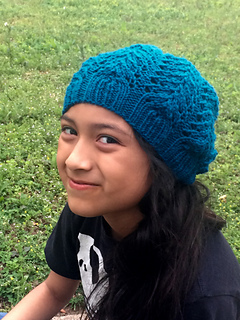 The hat uses a lace stitch that runs over just four rounds which makes it a great hat pattern for any beginning lace knitter. Seaforth is named after an unhabited island in the Outer Hebrides, Scotland. You’d probably need a hat if you visited! Pattern is both charted and written out. It includes tips on how to modify the hat as well as hints on how to tackle lace. Please note that the stitch pattern used is quite stretchy, so the sizing is very forgiving.